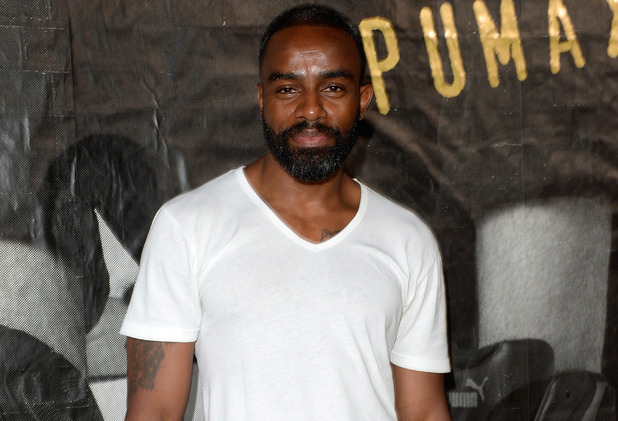 Former EastEnders star Chucky Venn has joined the cast of Casualty. The actor, who is best known to fans as Walford's Ray Dixon, will play a new nurse called Jacob Masters in the BBC hospital drama. Jacob's first scenes will see him arrive in the emergency department with an injured friend, but he quickly makes a big impact on the medical team. When Connie finds out he's a nurse and mentions that they're advertising at the moment, everyone is quickly won over by his subordination of the ruthless consultant. Speaking about the role, Venn said: "It's truly a pleasure and honour to be part of Casualty as it's such a successful long-standing medical drama. "I'm keenly relishing the challenge and my time in Cardiff and I look forward to tackling the role of nurse Jacob." Executive producer Oliver Kent added: "We are thrilled to welcome [Chucky] to Casualty. As Jacob, his good looks, charm and wit will certainly cause a tidal wave of testosterone in the emergency department. He's going to ruffle a lot of feathers and, no doubt, set a few hearts racing..."
Venn has already started filming with the programme, with his first scenes airing on June 11. I`ve always loved the name Jacob.....was tempted to call my son Jacob when he was born. Charles Venn has said fans are in for a big treat as part of celebrations for the medical drama’s 30th anniversary. An adrenalin-charged 110-minute special episode will be broadcast on BBC One at the end of the current series. The former EastEnders star, who plays nurse Jacob Masters, told What’s On TV magazine that his character will play a key role in the forthcoming instalment. Charles played Albert Square’s Ray Dixon, a boyfriend of Bianca Butcher (Patsy Palmer) and the father of her young son Morgan. He joined Casualty in 2015. The long-running series is pulling out all the stops to mark its milestone anniversary. It has already been announced that the 1000th episode features a special cameo appearance from the much-loved Lisa ‘Duffy’ Duffin, played by Cathy Shipton, on June 26. Duffy will also return to the show permanently in August to reunite with the Holby Emergency Department team. London-born Cathy was an original cast member of Casualty when it launched in 1986. Casualty fans can expect more surprises as the show celebrates a momentous achievement. That`s excellent news about Duffy - I have always liked her. 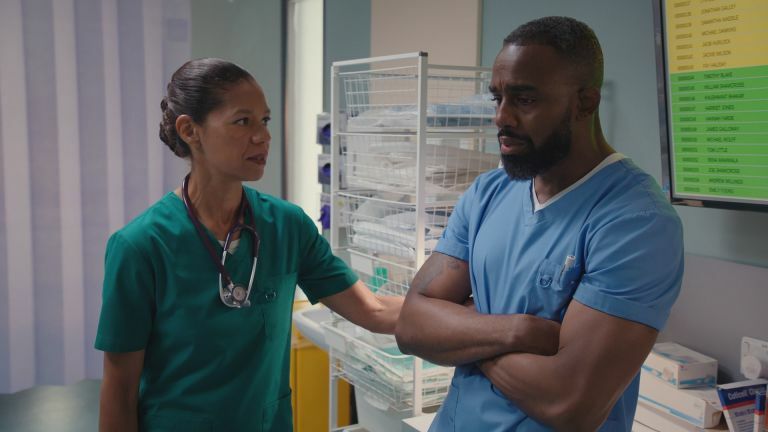 Casualty star Charles Venn has teased the show's "epic" anniversary episodes that will be kicking off this weekend. The actor - who plays nurse Jacob Masters in the medical drama - revealed that there will be shock after shock in store as the current series comes to a close on Saturday. But it doesn't end there, either. Casualty will be returning with a massive feature-length 30th anniversary special, which will see the hospital in danger and lives left hanging in the balance. Hinting at what fans can expect from this week's episode, Venn said: "You can expect pathos, high-octane energy, action. It's definitely an emotional roller-coaster. And myself, as a parent, the pain that's on display in this episode is palpable. You wouldn't wish that on anyone. "Without giving much away, there's a lot of trauma within this. On a grand scale, something very pertinent happens that affects a number of people and has a resonating affect on everyone in the ED. Expect something quite epic." Venn has previously said that the show's anniversary celebrations will be like a movie. Producer Erika Hossington has previously promised "an absolutely massive stunt" to top last year's boat set-piece. Casualty airs its series finale on Saturday, July 30 at 9.25pm on BBC One. It will return in four weeks' time with a 110-minute special. Casualty nurse Jacob Masters will take centre stage in tonight's heartbreaking episode (October 6) as he comes face-to-face with his estranged mother, Omo. Omo, played by former EastEnders star Ellen Thomas, has schizophrenia and will be brought into the ED by her grandson Blake after their day out goes horribly wrong. As old wounds are reopened, Jacob is forced to confront his extremely difficult past as he finally opens up to Elle and Blake about his difficult relationship with Omo. Digital Spy recently caught up with Charles Venn – who plays Jacob – during a break from his Strictly Come Dancing training to chat about tonight's sad scenes and find out what's next for his character after this. Why has Jacob never told anyone about Omo's illness? "When Jacob was young and Omo was going through this, he didn't know much about it. He even mentions at one point in the episode how they didn't have a name for the condition back then. He just assumed it was just a thing his mum went through and he just accepted it. He says to Elle at one point, 'Why do you think I spent so many nights at yours?' He stayed over at hers but he didn't want to say anything – it was something he wasn't very comfortable talking about. "Over time, he has just decided that it's too much to cope with. When he was teenager and old enough to move out, he realised that he needed to stick around. He upped sticks and has rarely seen his mum since. He thought it was best to keep his distance from her." What is his reaction when he first sees Omo in the ED? "Shock – absolute numbing, arresting shock. She is the last person he expected to see, especially at his place of work. The last time they met up, it wasn't a very good experience – it was a bad meeting as she had another breakdown. She is convinced that her son is going to hurt her, and despite all his promises and assurance that he isn't, and that he loves her, her mind isn't wavering. She is adamant that he's going to cause her harm. "When the last encounter happened, he decided that was it and he knows it's best to keep away from her. So when he does see her, it's total surprise. It really takes him aback." Is this going to explain more about why Jacob is the way he is? "Very much so, yes. As a teenager, he saw his mother go through something that he couldn't explain and that she couldn't explain until she was diagnosed. He was receiving mental abuse, and I would imagine, physical abuse to a degree as well. He did go away and learn what the condition was – that was something that drove him to become a nurse. "However, he did also go on the wrong side of the tracks and became a rebel because he didn't have the guidance that was required – his mum wasn't able to do this. He did go off the rails for a time but ultimately decided to try and make a difference. He wanted to show younger people how to stay on the right tracks and so decided to go down the medical route and become a nurse." Have you enjoyed exploring Jacob's backstory? "Yes, very much so. There is so much to Jacob. When he was younger, he had a lot of people he looked up to who weren't necessarily responsible people – he was around bad guys, and for a time, he was bad himself. He knows those people and lots of those people chose to stay in that environment and are now dead, or in jail. Some of them chose to change their life but unfortunately not many. There is now talk of us going back and having Jacob revisit his former stomping ground and meeting some of these people. There's talk of us going down that route with his story in the future." Would he like to rebuild a relationship with Omo? "It's not possible at the moment. After what happens in the episode, it's a very tough ask to try and rebuild a relationship. She is very, very sick and needs a lot of help, and until that point comes, it's never going to feasibly work. There are moments where you see this wonderful mum in her, and Jacob softens when he sees it too, but it's very momentary. It's a very difficult set of circumstances." What was it like working with Ellen Thomas? "She's amazing and such a fantastic actress. She's recently won an award for her contribution to acting. There were a lot of people on set, saying, 'Have you seen Ellen Thomas? She's just delivered an incredible performance'. And when I was doing those scenes with her, I was blown away. I've worked with her before but nothing prepares you for that kind of moment. I've never seen her play someone like that before. She made it almost easy for me to play off. It was frighteningly intense." Would you like to see him reunite with Connie? "Yes absolutely. That was a love affair and a very popular relationship – Jacob hasn't had that before. What we saw with the late Sam Nicholls was an affair, but with Connie, that was a relationship. You saw the pain when they broke up and it's almost like it became an all or nothing situation. They were either together or they don't interact at all. These days, they are respectful to each other but they keep out of each other's way. I have fans asking me everyday if they are going to get back together but I am a strong believer of never say never. We await the day that does eventually happen. It will be part two of Jonnie." How is it going at Strictly? Have you experienced any training injuries yet? "I wouldn't go as far to say I've got a training injury, but I've got a very sore shoulder, an aching achilles and my knee feels like it's sleeping every so often – I have to keep waking it up. It's all these types of things; you just ache all over. I said this to Karen and she said, 'Welcome to the dance world!' You experience these things on a daily basis and just get used to it." Is there any rivalry between the contestants or are you all getting on well? "Everyone is so supportive of each other, it's such a beautiful thing. During the run through, we have a big screen in the green room and we get so excited when we see each other improving and their progression from the last week. It's a lovely thing to see. We will continue to encourage and support each other. There will never be any hampering, trying to dissuade or distract each other at all – not within the Class of Strictly 2018. It's not happening! But of course we know it's a competition, and whoever goes is going to go. We will wish them all the best, but me and Karen are just praying it isn't us!" How are you juggling your Strictly commitments and Casualty filming? "No sleep, meditation, and a lot of ice bags! I'm trying to juggle the script reading while going through the dance steps. I am waiting for them to ease up on my scripts and filming schedule. It's really hard work." Casualty airs tonight at 8.35pm on BBC One. Casualty is bringing back EastEnders star Ellen Thomas for a huge new story involving show regular Jacob Masters. Ellen, who previously played Walford's Claudette Hubbard, joined the BBC medical drama for a brief stint last year, where she played Jacob's mum Omo. Viewers will remember how Omo had schizophrenia and was forced to seek urgent medical care when her problems came to a head. Now, Ellen will be reprising her role as Omo for another stint this year as Jacob's complicated past looks set to be explored further. Charles Venn – who plays Jacob – posted a picture of himself and Ellen on Twitter yesterday (February 5), saying: "Strong Storyline coming up with the brilliant @ellenthomasuk, can’t wait for you guys to see it.."
During a chat with Digital Spy last year, Charles promised that there was more to come from Jacob's story as the show delves further into his backstory. He said: "There is so much to Jacob. When he was younger, he had a lot of people he looked up to who weren't necessarily responsible people – he was around bad guys, and for a time, he was bad himself. "He knows those people and lots of those people chose to stay in that environment and are now dead, or in jail. Some of them chose to change their life but unfortunately not many. "There is now talk of us going back and having Jacob revisit his former stomping ground and meeting some of these people. There's talk of us going down that route with his story in the future."